KUALA LUMPUR (Nov 27): The FBM KLCI fell 12.26 points or 0.67% on technical correction, after registering gains for the past three days. At 5pm, the KLCI settled at 1,829.91 points. The KLCI had fallen amid lower crude oil prices, in anticipation that Organisation of Petroleum Exporting Countries (OPEC) member nations would not cut output to support prices. Danny Wong, CEO of Areca Capital, said the decline in blue chip stocks such as Tenaga Nasional Bhd, Telekom Malaysia Bhd and Felda Global Ventures Holdings Bhd had weighed on the KLCI today. “The fall in the index today is most likely just a correction, as the index had posted gains over the past three days,” Wong told theedgemarkets.com. On oil prices, Wong said an output cut by OPEC was unlikely. He however, said oil prices might rebound in December this year, due to winter in the northern hemisphere. “There will probably be a rebound in oil prices around mid-December due to higher oil consumption for heating purposes, as the winter season approaches,” Wong said. Bursa Malaysia saw 1.55 billion shares, valued at RM1.36 billion, traded. Decliners outnumbered gainers at 567 versus 252, while 304 counters were unchanged. British American Tobacco (M) Bhd led decliners, while Carlsberg Brewery Malaysia Bhd led gainers. The most actively-traded stock was Nova MSC Bhd. Regionally, Asian markets were mixed. 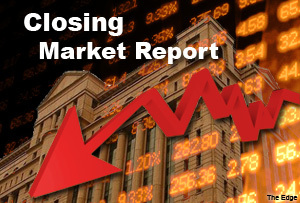 Japan’s Nikkei fell 1.03%, Hong Kong’s Hang Seng decline 0.45%, while South Korea’s Kospi rose 0.06%. Reuters reported Asian stocks hit a one-month high on Thursday, as investors bet more central bank stimulus in China and Europe would shore up the global economy, while oil prices tumbled to a four-year low, as hopes for output cuts by OPEC faded.